Returning Champion: Damian Lillard, Portland Trail Blazers. TV: Part of TNT's coverage of All-Star Saturday Night, beginning at 5 p.m. (pst). 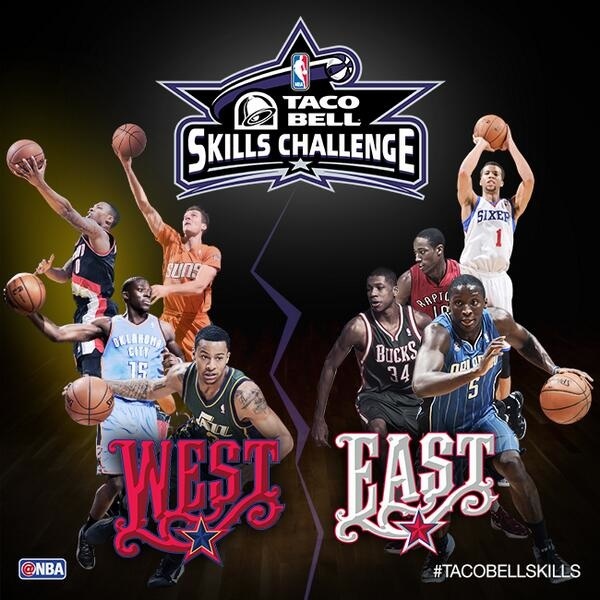 The Skills Challenge will be the second event. What: The format is new; rather than have an individual winner as in past years, eight players will make up four teams -- two from each conference. The competition will be similar to that of the NBA playoffs in that the two conference teams will compete against each other in the semifinals for the chance to compete against the champion from the other conference in the finals. TWO TEAMS PER CONFERENCE - Two teams of two players for each conference will compete in a timed obstacle course relay competition consisting of dribbling, passing, & shooting. COMPETITION FORMAT -: Each conference will field two teams consisting of two players. Each team of two players will run the course, competing in a relay format for a single overall time. OPENING LAYUP/DUNK AND FINAL SHOT CHALLENGES - For the opening layup/dunk and the final shot, the player must rebound his own ball until the basket is made. PASSING/SHOOTING CHALLENGES - The passing and the top of the key shooting challenges are considered completed (player can move on) when he either (1) successfully hits the target/makes the shot OR (2) exhausts the corresponding rack of balls while attempting to make the target/basket. BALL HANDLING - Players must observe basic NBA ball-handling rules while completing the course. DISQUALIFICATION - Players are subject to disqualification for failure to complete all of the challenges as they are designed and intended to be run through (at the final discretion/judgment of the referee). There are no time penalty assessments on the course. INSTANT REPLAY -- At the discretion of the referee, television instant replay may be consulted for clarification of rules compliance. FIRST ROUND - The two Eastern Conference teams will compete first, followed by the two West teams. The East team with the fastest time advances to the Championship Round. The West team with the fastest time advances to the Championship Round. CHAMPIONSHIP ROUND - The fastest East team and fastest West team from the First Round will compete to determine the competition champion. The team with the slower First Round time will go first for the Championship Round. The team with the fastest Championship Round time will be crowned the Skills Challenge Champions. TIEBREAKERS - To Advance from First Round - In the event of a tie amongst conference teams to determine the Championship Round participant, the tied teams will repeat the course. To Determine Champion - In the case of a tie between the two teams in the Championship Round, the tied teams will repeat the course. This could be a tough competition for Lillard and Burke. I think if they can get past the opening round then they could win the whole thing. Their toughest competition is probably Dragic and Jackson. It is starting soon. Go Lillard!!! I think the first event is the Shooting Stars and then it will be the Skills Competition. I'm just switching over now. Nothing is really going to start for another 10 minutes or so. My guess is the Skills Competition won't start until after 6 p.m. our time. The whole thing is only scheduled from 5:30 to 8 pm. I want to let everyone know that we will be jumping from this thread to the 3-Point Shootout thread when this competition is done, then when the 3-Point Shootout is done, we will jump to the Dunk Contest thread. I will announce when I am switching threads. Of course anyone can keep posting about any of the events. Wait so it's starting at 6 ? Ahhh it's Almost Lillard time!